Certain kinds of wood such as pine or fir have growth rings with contrasting hardness. A wire brush or wheel (or a sand-blaster) can be used to erode the softer wood away faster than the harder rings, leaving ridges of harder wood to produce an interesting texture. I use this in my some of my shells instead of the usual smooth and glossy finish. It produces a whole different look and feel. Always wear safety glasses while using wire-wheels, they do shed wires sometimes and you can imagine what they could do to your eyes. 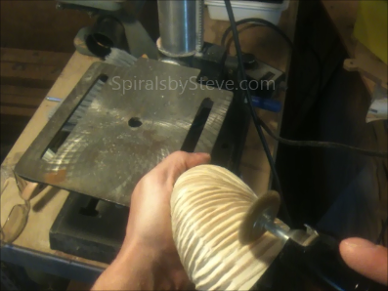 I use a small wire wheel with a quarter inch shank diameter in my flex-shaft rotary carving tool to erode the softer part of the wood by moving the wheel along the softer growth rings between the darker and harder rings. Always wear safety glasses while using wire-wheels, they do shed wires sometimes and you can imagine what they could do to your eyes. The width of the wheel can be made narrower to get down into closely spaced rings by shaping the wire-wheel itself. This is done with a grinder. 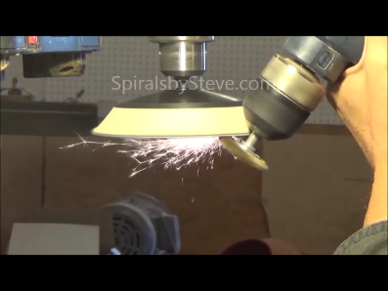 Chuck the wire-wheel into a hand drill and spin it against a spinning grinding wheel or sanding disc to produce an edge on the wheel. While grinding the wheel, be sure to orient it in a way so that the abrasive first makes contact at the base of the wires and moves outwards so that it doesn't catch the wires and bend them out making the wheel wider. The wire-wheel works while spinning in either direction. This particular wheel looks like the wire is brass, but it is actually steel that is plated - a magnet sticks to the wires when tested. 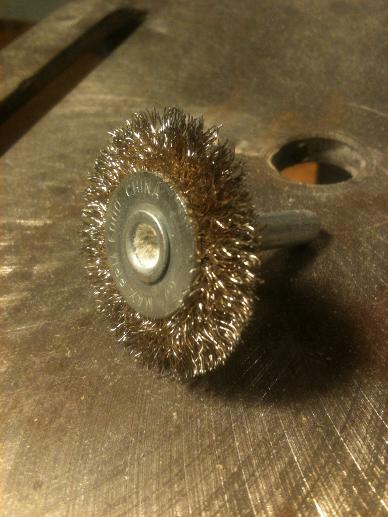 After the soft wood has been eroded, you'll still need to sand to get rid of the scratches left by the wire-wheel.